It's the old 'open borders' lie. Sen. Graham said Democrats want migrant violent offenders to walk around free and not be deported. Once upon a time, Sen. Lindsey Graham had the media fooled into believing he was a serious politician. Those days are gone. After the passing of his mentor John McCain, Sen. Graham has become one of Trump's biggest supporters and now fits right in with the lie-now crowd. On Sunday Morning Futures with Maria Bartiromo, Sen. Graham made bogus allegations against the Democrats negotiating to keep the government open by claiming the Democrats want migrant violent offenders to walk around the country free. Graham said he supports a "continuing resolution" to keep the parties negotiating if the impasse reaches Friday and added, "I don't see how in the world Trump will cosign a bill that reduces bed space for violent offenders." 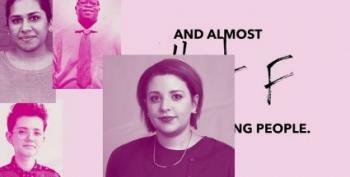 He kept reiterating the same message: "How in the world after that speech does [Trump] sign a bill that would reduce the number of bed spaces available for violent offenders?" During the broadcast, Bartiromo said they were breaking real news, but of course, Graham was manipulating the debate to suit his needs. The Democrats want to limit the number of beds ICE has in the U.S. to stop the administration from abusing its power. 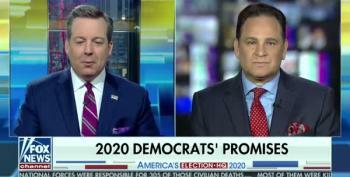 "And now, the Democrats want in return for any money put on the table for border wall funding a reduction in the number of beds for violent criminals?" she said. "Yeah. These people have gone insane in terms of trying to fix problems." 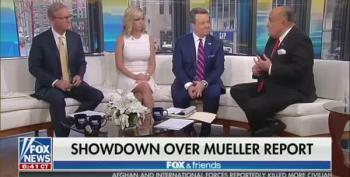 Sen. Graham then launched an attack on the New Green Deal with the same nutty and off-the-wall exchanges you'd expect Rep. Louie Gohmert. He claimed the GND wants to pay people for not wanting to work, ban people from cooking outdoors, and banning cows altogether. The NY Times explains the real position. The impasse appears to center on Democratic demands for a limit on the number of unauthorized immigrants already in the country who could be detained by Immigration and Customs Enforcement officers, according to aides familiar with the talks. Democrats say a cap of 16,500 beds in ICE detention centers would force the Trump administration to focus on detaining undocumented immigrants with criminal records instead of using indiscriminate sweeps that drag in otherwise law-abiding residents. The Democrats have said, "The White House’s insistence on excluding people charged or convicted of crimes, even nonviolent drug offenses, would give the White House almost limitless power to detain people and make existing rules irrelevant." Sen. Graham was so off-the-wall that Maria kept him on the show for almost 30 minutes. I imagine Trump was proud. 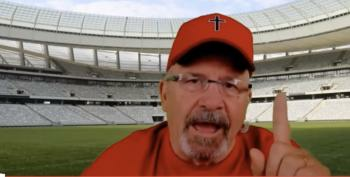 Dave Daubenmire ramps up the echo chamber set in motion by Boss Limbaugh and Fox News to engage and enrage Donald Trump's base. Thanks to federal Judge Michael McShane, Title X providers may still refer patients for abortions, if they so choose. 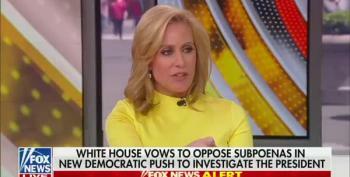 Melissa Francis claims that Democrats "care about Russia now because it cost them an election." 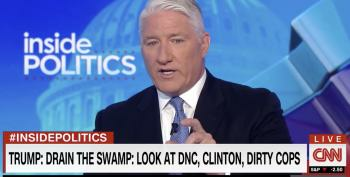 CNN Host John King did not let Trump get away with his claim he was "breaking down the swamp." And then he went after Rush Limbaugh. Hard. They whine about being called "militia" or "vigilantes." But as Cal Perry tells Stephanie Ruhle, if it walks like a duck...and technically, what they do to migrants is called kidnapping. "It's the Democrats all you can eat buffet and everything's free by the way on the buffet!" says the Christian Broadcast Network hack. 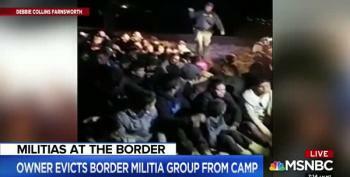 Stephanie Ruhle's show looked at the United Constitutional Patriots, a group of armed private citizens who "patrolled" the New Mexico border illegally harassing and detaining migrants from Mexico. 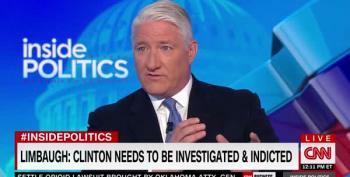 John King was not having any part of Trump's absurd claims, or Rush Limbaugh's slings and arrows at Hillary. More "nothing to see here" from Rudy.